Supports for burning ISO files of PS3/PS2 games (including Blu-ray discs and DVD image files). Supports for burning ISO files of Xbox 360 games. Supports for copying PC games as well as reading and burning image files from the disc. Supports for copying Wii games as well as reading and burning image files from the disc. It is against the law to reproduce copyrighted materials for the purpose of selling them to third parties. 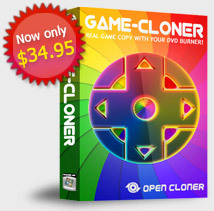 Laws of some countries only allow you to make one copy of any software or media for personal and archival purposes, which is the only intended use for Game-Cloner. This program is not meant for those who intend to break copyright laws. In no way will we be held responsible if you do so. Any other illegal use of this software is strictly prohibited.